There are many ways you can boost the heating and cooling energy efficiency of your home. A Daikin zoning system installed by DuctWorks Heating & Air Conditioning is one of them! Similar to the light switches that control the lighting in different rooms of your home, zoning allows you to adjust the temperature in separate parts of your home independently of one another. The benefit? You have the capability to heat or cool rooms that are in use while saving energy by maintaining a lower temperature in others. In fact, by using setbacks and zoning controls, you can save between 10% and 20% on heating and cooling energy. Zoning is a win-win because you enjoy enhanced comfort and those added energy savings with room-to-room temperature control. Zoning can be added to an existing home or a home that’s under construction. Although it’s easier to design zones into a home while it’s being built, many of our customers are converting their existing ductwork into zone systems. 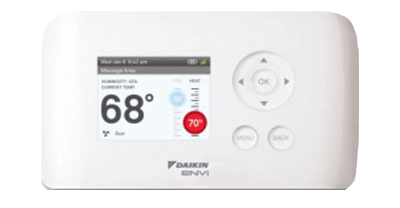 The Daikin ENVi Intelligent and programmable thermostat is the newest addition to Daikin's residential controls offerings. This wall mounted controller features a backlit LCD display and easy to understand menu items for all of your personal comfort settings - temperatures, weekly scheduling, vacation schedules, and even your weather forecast. Best of all ENVi is a WiFi programmable thermostat, so you can access it via the web using your tablet, smartphone or computer. You get your own personalized secure web interface to make any changes you want, from anywhere you may be. Contact us for an evaluation and estimate. We’ll help you determine the best Daikin ENVi system for your home.